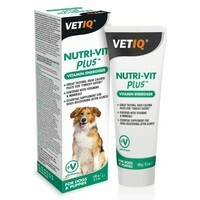 VetIQ Nutri-Vit Plus Dog Vitamin Mineral Support is a high calorie, tasty and nutritional supplement providing a range of vitamins & minerals for your dog. Ideal for convalescing Dogs and Puppies suffering from loss of appetite, these nutrients work together as an aid in maintaining your pet's overall health, providing extra energy and nutrition in an easily digestible paste. 1 teaspoon (5g) per 10kg bodyweight. The paste can be given alone or in combination with regular food. This item is great if you have poorly non eating cats like I did. The paste is very palatable and they love licking it off their paws for hours! Helped them gain an appetite too. Highly recommended.